Take a Moment: Three things are discussed for bringing back a more hopeful perspective regarding a difficult and defiant child. “Before I Get Mad” Poster: A teacher in West Virginia shares a fun and effective way to teach students how to control emotional outbursts. The List: What do you do if a youngster comes to counseling or therapy with a list of items they want to cover during every session? Interesting. Finding a Counselor or Therapist (Part One): This is the first of two parts of an answer to a father’s questions about what makes a good counselor or therapist for his child, and where does one find them. (E-Book) The Behavior Modification Trap: This 18-page e-book is actually the sixth chapter from Dr. Sutton’s latest work-in-progress, The Changing Behavior Book. In this e-book, Dr. Sutton addresses why tangible rewards and incentives often fail with some youngsters, and what can be done to defeat the “trap”. Digest Archives: Dr. Sutton discusses how back issues of the Digest are still being archived, and shows readers how to access them. How Long? This is Dr. Sutton’s tribute to the late Art Linkletter, who passed away this summer at age 97. Included is “My Best Introduction”, Linkletter’s contribution to the book for grandparents, Grand-Stories. 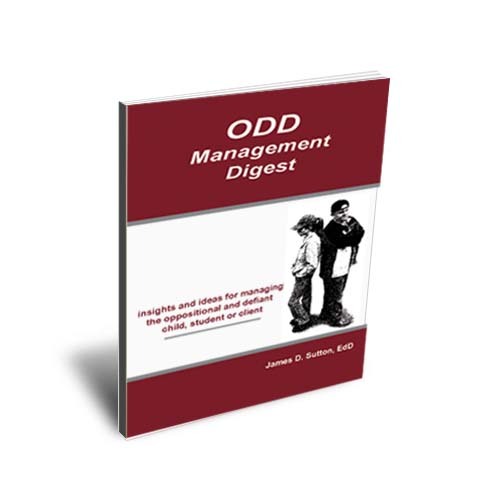 For a complimentary subscription to the ODD Management Digest, CLICK HERE. The Digest will appear monthly in your email as long as you want, and you can cancel it at any time. This blog, It’s About Them, was founded in 2006 by child and adolescent psychologist, Dr. James Sutton. Content will vary, but the message here promotes courage, kindness, vision and the powers of the human spirit in ourselves and our children. Dr. Sutton can be reached at james78064@yahoo.com. Below are the covers of some of the books written by Dr. Sutton. Paperback books are listed on the left; e-books on the right. Click on a cover for more information. The e-books are immediately downloadable; one of them is even FREE.